In Hitchcock’s Rear Window, Jimmy Stewart played a photojournalist recuperating from a broken leg suffered while on an exotic assignment. Randal Hendricks is not quite as dashing. He was paralyzed from the waist down when a drug deal went sour. Rather shortsightedly, he funded his ill-advised foray into the narcotics trade with a vig from a loan shark. 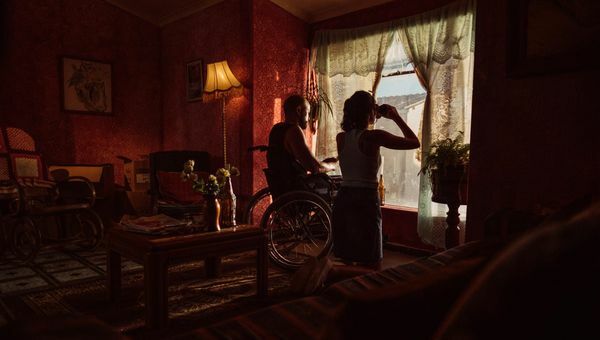 Yes, there will also be a murder committed in the opposite building during the early going of Nosipho Dumisa’s Number 37 (trailer here), which screened during the 2018 Fantasia International Film Festival. The wheelchair-bound Hendricks only has himself to blame, but he never seems to learn. Instead, he cooks up ever more reckless schemes to compensate for each disaster. His girlfriend Pam Ismael has not thrown him out yet, but she really should. His self-pity and passive aggression are not very pleasant to live with. He is not even grateful when she gives him a pair of binoculars to help pass the time. Of course, he soon takes to voyeurism, so he happens to witness the murder of a corrupt cop in the apartment across the grubby courtyard. Instead of calling the despised police, he hatches a plan with his slacker pal Warren to extort 100 grand from the sinister “Lawyer” to pay back the just as evil Emmie. Unfortunately, Warren is not the sort of accomplice who inspires confidence. Likewise, it is unwise to antagonize a cat like Lawyer. Yet, Hendricks remains convinced this is his only play. Dumisa proudly wears her Hitchcock influences on her sleeve, but she substitutes grittiness and moodiness for the wit and elegance of Rear Window. It is safe to say Ismael’s frocks can’t compare to Grace Kelly’s wardrobe. Nevertheless, she quite dexterously piles up one darned thing after another on poor luckless Hendricks and the long-suffering Ismael. In fact, she unleashes a veritable perfect storm of criminal mayhem down the stretch. Irshaad Ally is all kinds of intense as the intensely exasperating Hendricks. However, Monique Rockman really sets the hook as the naïve and vulnerable Ismael. Viewers will want to kill Ephram Gordon’s recklessly irresponsible Warren themselves, while David Manuel and Danny Ross seem like they are in a pitched battle to out-do each other’s creepy malevolence as Lawyer and Emmie, respectively. Unlike Stewart’s well-appointed bachelor pad, Ismael’s apartment is dark and uncomfortably claustrophobic. It is the sort of thriller location that automatically creates tension. 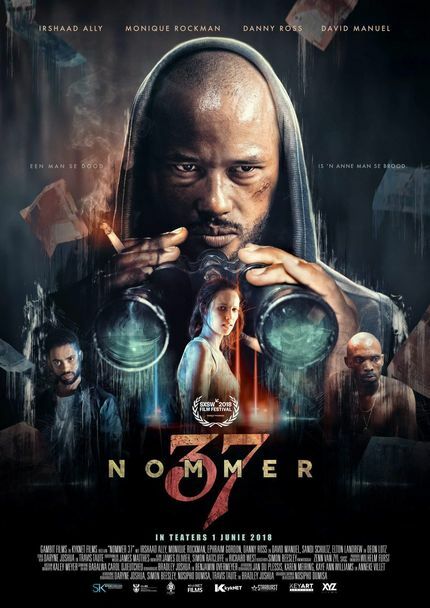 Frankly, Dumisa might overdo the naturalism for viewers seeking pure suspense escapism, but nobody can say it doesn’t reflect the street-level realities of contemporary South Africa. Recommended for fans of scrappy, hard-edged thrillers, Number 37 had its Canadian premiere at this year’s Fantasia.